Written by Lizzy Greenburg on September 23, 2018 Holiday ideas. Watching those movies reminds me of the January sales tax “perfect storm.” In Q4 everything is gravy – you’re making sales, gaining new loyal customers, and watching the dollar bills pile up. Then January rolls around and you have a sales tax filing due. Suddenly all those sales translate into exponentially more work as you attempt to fill in your tax forms. If you’re completing this form, you’re required to figure out where each of your sales was made and how much sales tax you collected from your customers. It can be a long, intimidating process — and pretty annoying if you’re riding high from collecting those Q4 profits. Here’s how you can prepare now so the post-holiday sales tax perfect storm doesn’t catch you unaware. Filing a sales tax return is always easier when you’ve collected the correct amount of sales tax in the first place. Sales tax “nexus” is just a fancy way of saying a “significant presence” in a state. If you live in the U.S., you always have sales tax nexus in your home state because simply living and working there qualifies as having a significant presence. Outside of your home state, other physical triggers for sales tax nexus include employees, stores or other locations, inventory, affiliates, or even selling items at a trade show or craft fair. 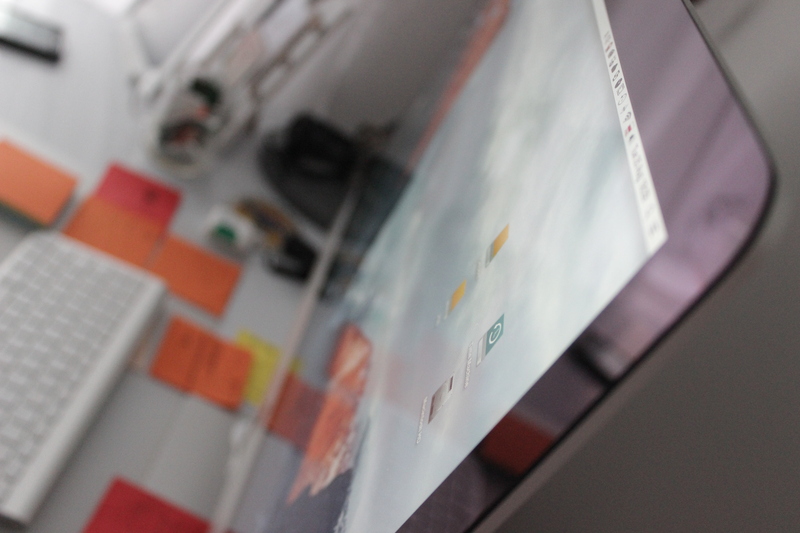 Read more about what creates nexus for your store. In addition, regardless of if you have a physical presence in a state, you may be required to comply due to economic nexus. Meaning that your economic activity (ie: revenue and/or transactions) in a state might be significant enough to require you to comply with sales tax laws in that state. Economic nexus is now quite important for eCommerce sellers after the Supreme Court case of South Dakota v. Wayfair. This landmark ruling made the concept of economic nexus law not only legal but enforceable in court. Read more about economic nexus and what it means for your store. To define economic nexus, some states are using South Dakota’s definition of a business doing more than $100,000 in revenue in South Dakota OR more than 200 transactions in a calendar year. While other states are coming up with their own thresholds for revenue and/or transaction volume independent of this ruling. The bottom line for merchants is that economic nexus laws are being created and revised what seems like every other week! Determining where you meet economic nexus thresholds may seem complicated, but TaxJar will do for you automatically with the TaxJar Sales & Transactions Checker. Try it FREE today and we’ll show you the states where you meet their requirements. 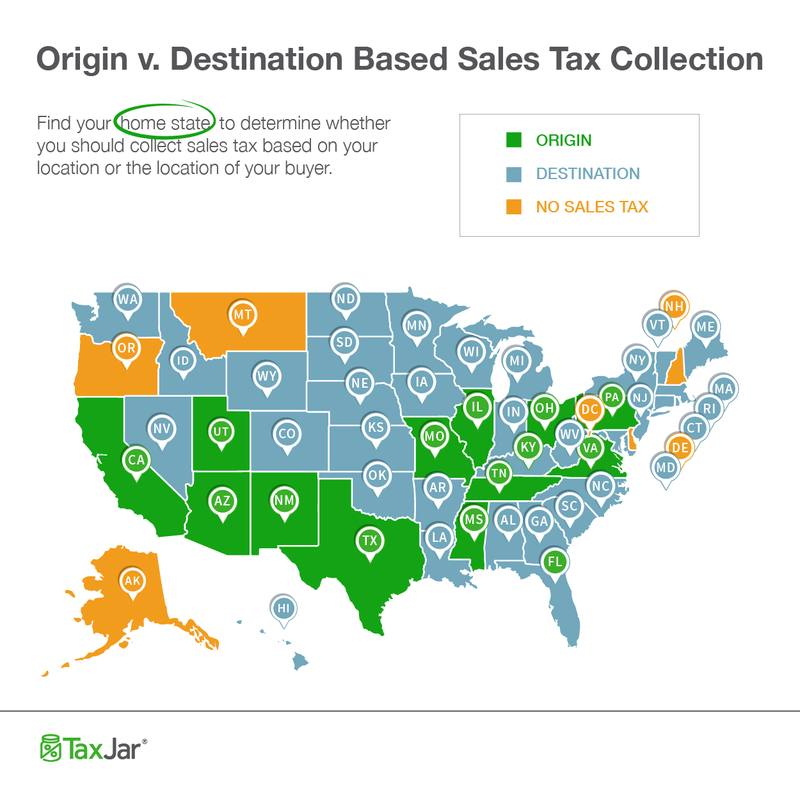 The state you live in is either “origin-based” or “destination-based” when it comes to sales tax, and it’s important to know which your state is. Not sure if your state is origin- or destination-based? This map will help you kick things off. Origin-based states are fairly simple. If you sell from your home, then just charge all buyers in your state the sales tax rate at your home. You can also check your local sales tax rate with this sales tax calculator. Destination-based states, though, are a bit more complicated. In these states, you charge sales tax based on the rate at your customer’s ship to address. You can read a whole lot more about collecting the right amount of sales tax here. Why is it so important to collect the correct amount of sales tax? If you don’t, you could end up paying sales tax out of pocket in January, and nobody wants to end a profitable Q4 with a tax bill! Most “tangible personal property” is subject to sales tax. But some items are taxed differently depending on the state where it’s sold. For example, grocery items are not taxable in California, while textbooks are. But in Minnesota, both grocery items and textbooks are tax exempt. Conversely, digital products like eBooks are tax exempt in California, but subject to sales tax in Minnesota. Every state is different, so be sure you’re collecting (or not collecting) the correct amount of sales tax on your products. Here’s a riddle. What’s more profitable for your business – figuring out new ways to get your products in front of holiday shoppers or filing sales tax? World’s worst riddle, I know, but hopefully it brings home the point that there’s only so much time during Q4 to hit your sales goals. If reporting and filing sales tax is getting you down, turn to technology to automate those administrative hassles. Sales tax getting you down? Try automating the process to save yourself time and hassle. The perfect sales tax automation tool will connect to your WooCommerce store and create return-ready sales tax reports. And even better, it will file your returns for you! Save yourself from the pain of matching zip codes to taxing districts, and free yourself from spreadsheets. Lean on TaxJar as your automated sales tax solution to help your business eliminate valuable time spent on tasks that don’t lead to more revenue!. Choose TaxJar AutoFile to automatically file your returns and you can get back to doing what you love– growing your online business. There’s not much rhyme or reason to sales tax due dates. Some states want to hear from you on the last day of the month after the taxable period, others want to hear from you on the 20th. Others want to hear from you on the 15th, or the 23rd, or they want you to file on a different date depending on how much sales tax you collected. If you file in more than one state, it can be difficult to keep track of your due dates. Sales tax automation with TaxJar helps you overcome the madness by letting us handle your filings whenever they are due — we’ll ensure you file on-time, every time. I know what you’re thinking. 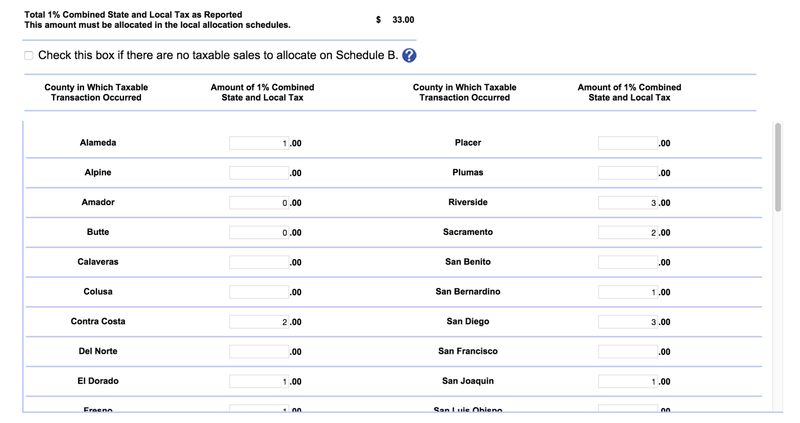 You’re thinking that, even with automation, all this sales tax collection is a lot of work for a busy online seller. 24 states are willing to give you a discount for filing early or on time — here they are! 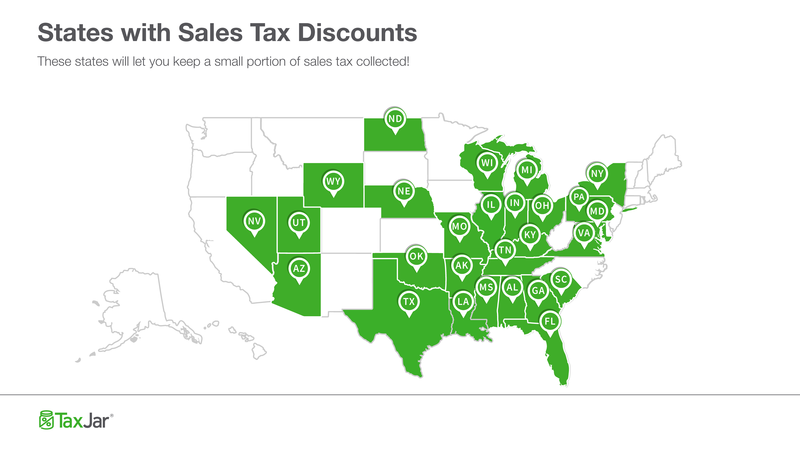 At least 24 states will provide online sellers who file on time with a sales tax discount. This means you get to keep a very small portion (usually 1-2%) of the sales tax you collected from customers in exchange for filing your sales tax return on time. File your taxes on time after the holidays, and your state might give you a discount. If you use TaxJar’s AutoFile to automate your returns, we make sure your returns are on-time every single time. That means you’ll get your timely filing discount every time. And in some cases, your discount covers the cost of using TaxJar! Getting started with TaxJar is quick and simple, and you can do it anytime (think: before January). While we can guess you probably aren’t looking forward to handling your sales tax near year, we want to show you how simple it can be to check off your list now so you don’t have it looming over your head. After you’ve connected TaxJar to your WooCommerce store, it’s smooth sailing as you focus on holiday promotions and increasing sales. You’ll have peace of mind that your sales tax is handled, and you can rest easy knowing your filings are automated when January rolls around. I hope this article finds you in the middle of a happy and prosperous Q4. For more than you probably ever wanted to know about WooCommerce sales tax, check out our Sales Tax Guide for WooCommerce Store Owners. Have any other questions or thoughts about post-holiday taxes? Start the conversation in the comments. Thanks for these amazing holidays tips.